This weekend we visited The Joyce Theater for the family matinee to see famed dancer illusionists MOMIX perform "Opus Cactus". It was an astonishing show and a must see while it's in New York City. Each dance moment took us into a different world filled with color and movement. We were amazed to see how the human body could be bent, stretched and curved into shapes similar to flowers, animals and ethereal creatures. photo credit: Rebecca Rasmussen, Beau Campbell (center), Lauren Jaeger in Ostrich of the Imagination. Eddy Fernandez for Momix. While I enjoyed all the performances, the ones giving us a peek into the life of lizards, bugs and other non humans gave me extra delight. My son's favorite parts were dances using the rods and showing strength. Overall the dancers have amazing body strength throughout the whole show but this dances really showed how toned and coordinated they are. We both highly recommend welcoming back MOMIX "Opus Cactus", by going to see it! 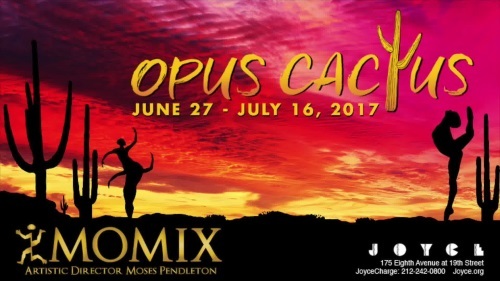 MOMIX will feature acclaimed work “Opus Cactus,” at The Joyce Theater in New York City from June 27 – July 16, 2017. After a twelve-year hiatus from New York City, “Opus Cactus” returns with an abundance of fresh energy. Celebrating the wonders and beauty of the American southwest, Pendleton’s “Opus Cactus” is a gorgeously colored, richly inventive work of dance fantasy. Audiences will witness giant saguaros, tumbleweeds, fire dancers, cactus wrens, and a slithering Gila monster emerge from an ingenious use of costumes, lighting, and the human body as the superbly physical MOMIX dancers extend the reach of the imagination – and dance – into worlds strange and new. During the 2017 season, under the artistic direction of Moses Pendleton, MOMIX will transport audiences from their everyday lives into a fantasy world through its trademark use of magical lighting and imagery. Pendleton combines athletic dance, riveting music, outrageous costumes, inventive props and pure talent to create an entertaining multimedia experience. With music from the Swingle Sisters to Brian Eno as a backdrop, this kaleidoscopic, illusory world beckons you to suspend your disbelief and embrace the wonder that is uniquely MOMIX.